It is time for communion, and even this Evangelical knows that young children are discouraged from partaking, at least until they are old enough to understand the meaning behind the wafer, the meaning behind the wine. But of course if you know Sam and Abra, our youngest two children, you’ll understand how they squeeze into the aisle and practically run to the front. Father David is kind, and he does not forsake those little children. He gives them each a wafer, and he blesses them. Maile and I catch up to them, and our family shuffles through the line, then walks around the side, all the way to the back of the church, before circling and coming up through the center aisle. Maile’s face is a deep shade of crimson. But Sam, he seems energized by this new experience, and before I can reach for his hand he sprints down the center aisle towards our pew, stopping halfway to do a little dance, then starts off again, transforming his sprint into a skipping kind of jump. Maile and I look at each other. Sometimes the only thing you can do is laugh. To read more about grace in city life and our first time at St. James Episcopal Church, head on over to my guest post at Deeper Story. In our Episcopal church, anyone can partake. Anyone. No one expects that children should understand what they are doing before they do it. We feel that the enthusiasm that leads children to rush up the aisle and thrust their hands out is a beautiful expression of the thirst and hunger for God (and for belonging). I used to be embarrassed by how my kids didn’t behave perfectly at the altar rail, how they squirmed and chomped on their wafers and asked questions in inappropriately robust voices. 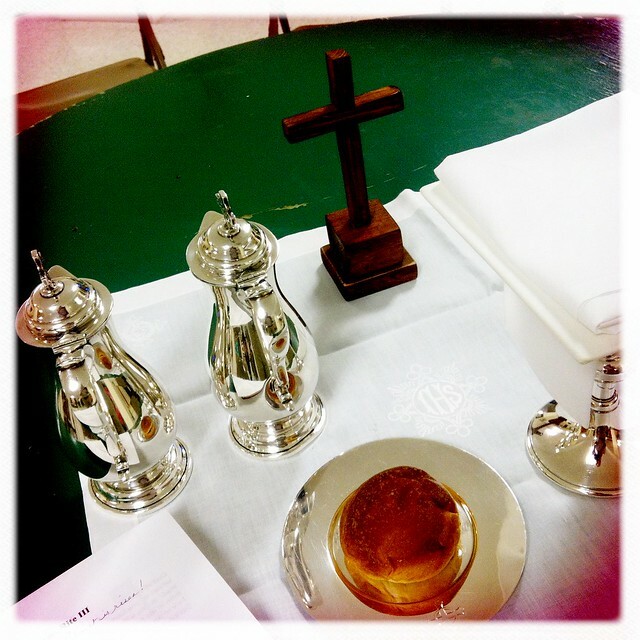 But I eventually learned that when our priest says, before every Eucharist, “This is Christ’s table, not ours, and everyone is welcome,” he means it. That his invitation includes even my squirmy, irreverent, enthusiastic little ones. Thanks, Ellen. I needed to read that.